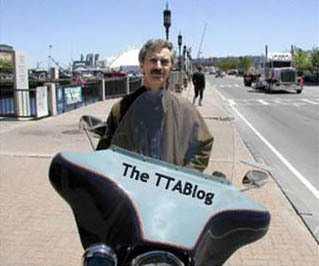 The TTABlog®: TTAB Finds No Use For "AUTHENTIKRUD"
The Board failed to see the humor in this Applicant's attempt to register the mark AUTHENTIKRUD for "mail order services featuring clothing and accessories for motorcycle riders." In re Aero Design and Mfg. Co., Serial No. 78188620 (November 19, 2004) [not citable]. Aero's specimens of use comprised a catalog page and a website printout, each featuring a bottle bearing the mark AUTHENTIKRUD. The Examining Attorney understandably took the position that the mark functions as a trademark to identify a product called a "stain kit," and not as a service mark. Aero admitted that it did not actually sell a stain kit or any other product under the mark AUNTHENTIKRUD. Instead, according to Aero, the mark is used "in jest to promote its catalog services:"
"The service mark and corresponding copy in the catalog and on applicant's website are written to amuse the reader, the potential purchasers of applicant's high-end motorcycle clothing. ...use of jokes and items offered in jest are part of applicant's promotional style." The Board had "two problems" with Aero's argument. First, Aero did not offer any direct evidence that customers would perceive the AUTHENTIKRUD stain kit as a non-existent, "joke" product. The Board noted that the kit has an order code and a price, and appears on the same page with five presumably "legitimate" products. Second, even if customers got the joke, that does not mean they perceive AUTHENTIKRUD as a service mark for the identified services.